2016 Castello di Verduno, Langhe Nebbiolo, Piemonte, Italy. 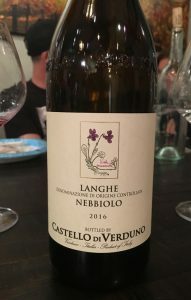 The bright and menthol laced Castello di Verduno Langhe Nebbiolo opens nicely to reveal tangy cherry (cherry drop) and plum fruits along with fresh mineral and vibrant acidity with hints of dried lavender, anise and blood orange. This fresh style Nebbiolo doesn’t scream baby Barolo, but you can see the family resemblance and this Piedmont red is easy to enjoy, best to enjoy with food though with it’s acid and tannin. Air brings out more fruit and a nice chalky detail with hints of raspberry and spicy elements with more perfume showing up too adding some rose petal to the overall joyous nature here. Maybe it’s unfair to expect a little more, especially at the price, but this Barolo producer has been picked to be a breakout star in the next few vintages, so it is too easy to fall to those expectations, though this wine is perfectly respectable and drinks very well. Mario Andrion, winemaker at Castello di Verduno is making some great wines and the family Burlotto has great holdings in most of the best Nebbiolo zones including of course Barolo and Barbaresco, with the grapes for this wine being grown in a vineyard located in the Verduno, Boscatto area, plus a selection of Nebbiolo that comes from Faset and Rabaja-bass in the Barbaresco zone. The Langhe Nebbiolo is a 100% tank raised wine with a cool 11 day maceration and a 9 months aging in stainless steel, they add a short period of bottle time before release, but everything is done to make for a fresh expression of varietal, and that is clearly evident in the results. Drink this pure Nebbiolo over the next 3 to 5 years, it’s well worth looking for, it has a lot of personality and subtle charms, and if you are in search of a more serious wine check out their Barolo or Barbaresco bottlings.